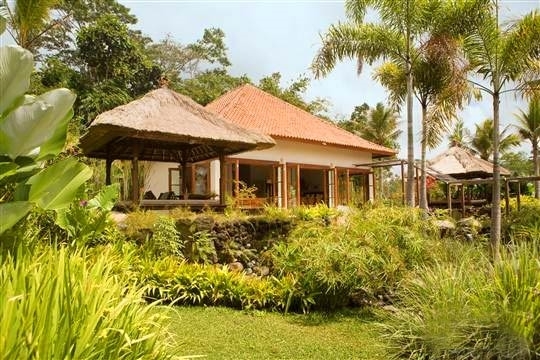 The 4-bedroom valley-side Bayad Villa, with one-hectare garden overlooking rice fields near Ubud, comes with two kitchens, plentiful living space, gym, TV Room and staff of 12. Tropical flowers and blooming bushes beautify balconies, terraces and swimming pools as pergola walkways, stepping stones and staircases transport you from place to place. Even in the rain, Bayad Villa’s aquamarine swimming pool, with its magically floating waterside balé (relaxation pavilion), is dramatic and inviting. 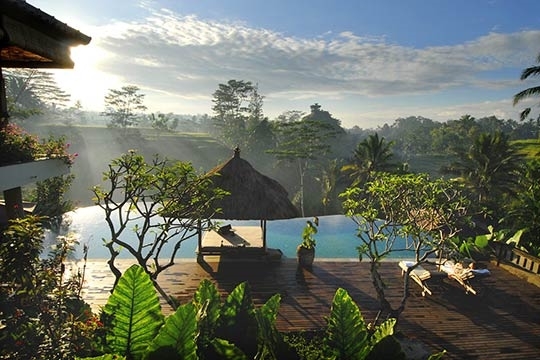 Low cloud temporarily mists the trees across the valley and the sound of the rain deafens until, suddenly, the gorgeous natural view – rice fields, treetops, jungle and even Mount Agung – captured so beautifully from the villa’s stunningly situated pool, returns to its bright, sunlit self. 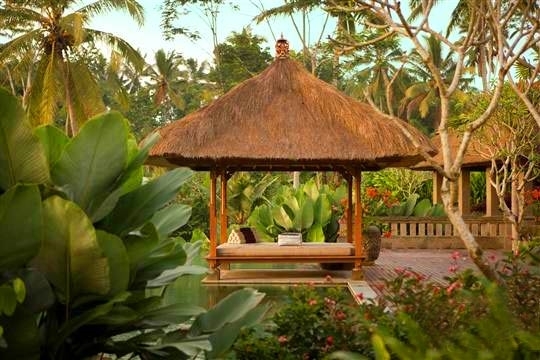 Bayad Villa’s luscious tropical garden – nearly one hectare in extent – pays tribute to Ubud’s climate as blooms of all sizes, shapes, colours and textures artfully engage the eye, whilst fish-filled ponds trickle into each other and down a narrow ravine flushed with ferns. 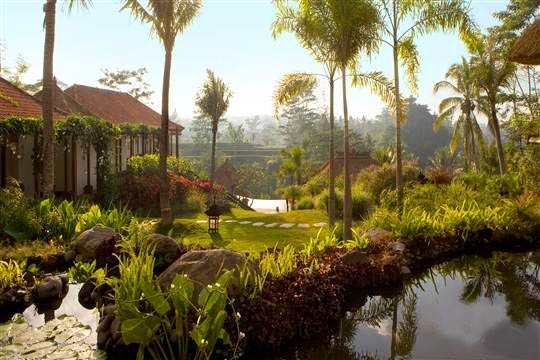 Set on a gently sloping hillside, Bayad’s four individually designed suites blend in amongst this exotic oasis, and look out over the stunning natural environs through frames of flower-flecked foliage. Named after Bali’s most historic towns, these suites are split into two self-contained clusters which share the conveniences of two dining locations, plentiful living space, a TV Room, a gym, a pair of kitchens, a spa room and, in addition to the main pool and terrace, a plunge pool, meaning that each pair of suites work well as a family unit. The villa’s atmosphere is suitably serene as befits its natural location, and the secluded situation of the suites within the large garden means that the property also feels perpetually private even though the whole valley is completely open for your admiration and intrigue. The opportunity to get out and explore the region is easy: bicycles and guides can be arranged for a small fee. 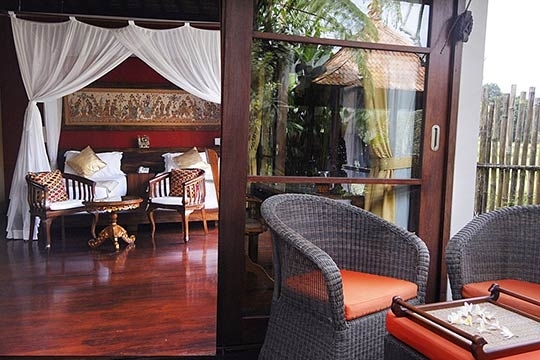 Bali’s cultural capital, Ubud, with its broad selection of shops, restaurants and art galleries, is just a 15-minute drive away and transfers to town are complimentary, with a car and driver also available for longer trips (at an extra charge). 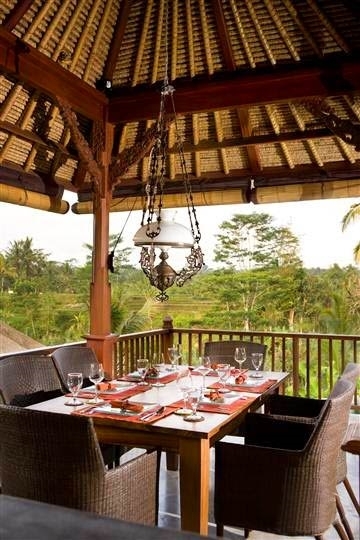 Bayad’s large staff team is completely at your service, including a very able cook who whips up a wide variety of Indonesian and Western cuisine from a priced villa menu. We loved the swimming pool and the view of the valley beyond. 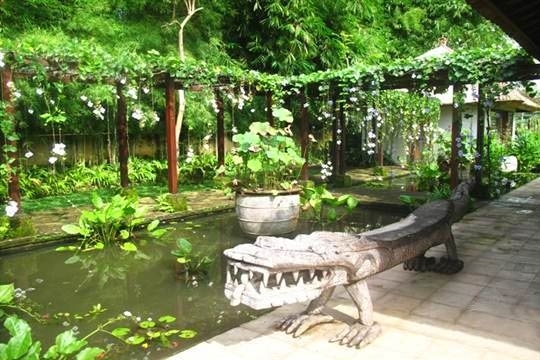 Bayad Villa’s garden is amazing and it felt so tropical. It was like a woodland overflowing with plants which, although carefully landscaped, were growing abundantly as if untamed. 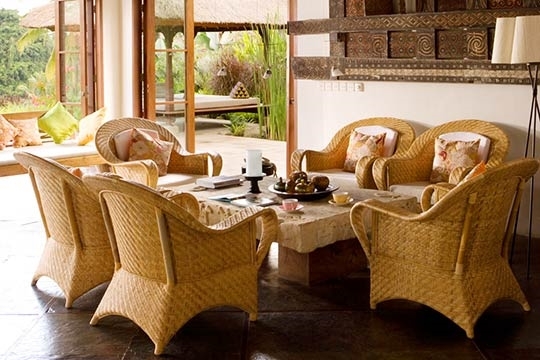 The villa felt spacious as such, and is perfectly set up for two families since each pair of suites is connected across the garden but self-contained, having their own entrances, swimming pools, kitchens and dining space. The main pool with its gorgeous curved infinity ledge creeping around the valley was a real focus of the property, however there really were lots of other options for relaxing and dining, including the verandas of each suite. That said, most were not fan-cooled and the main living pavilion, especially, got a little hot during the day. The staff were efficient and because the property is so large we hardly saw them apart from at mealtimes when they tended to gather around the main kitchen to chat, which was a little off-putting. We were informed by the management company, however, that they have plans to change the kitchen design which would resolve this problem. As if to compensate for any disturbance, the house manager really went out of his way to make sure we had everything we needed at all times. 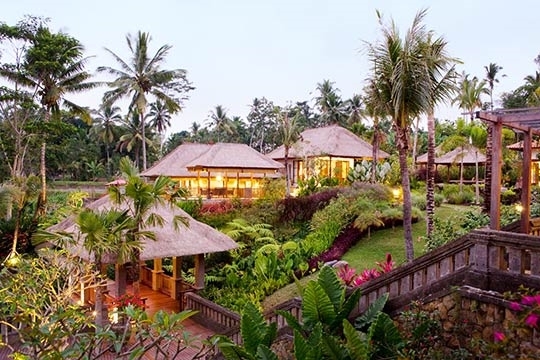 There’s quite an extensive priced menu at the villa – the cook’s excellent Balinese dishes come highly recommended and you receive a complimentary Balinese meal if staying more than seven nights. Self-catering is also an option but only for stays of seven days or more; in this instance, a 30% charge is added onto the total cost of your grocery bill if the staff do your shopping for you. 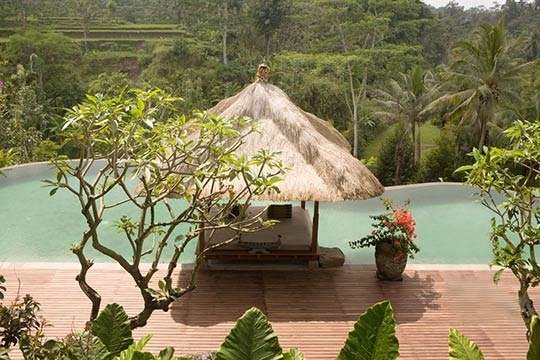 We loved the main swimming pool and the view from the terrace of the valley beyond; if you look over its infinity edge it’s a long way down to the rice paddies and woodland below which puts your location completely into perspective! Having a second sunbathing zone next to the plunge pool was another plus. 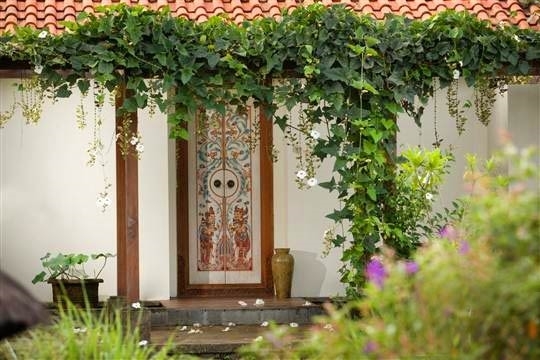 We thought the intricate detailing in the decor of the suites stood out and demonstrated a great amount of care and attention, and that the garden’s tropical flowers (the smell of the night jasmine was divine) were especially gorgeous. There was a football game going on in the valley below during the late afternoon which spoiled the peaceful atmosphere a little, although when we asked the staff about it we were told that they only play occasionally. The garden is a wonderland for children but since it slopes down the hill, and comprises ponds and walkways you’ll need to keep an eye on little ones. The enormous long-legged bees beneath the pergola are a bit alarming, but they are only trying to get to the pollen! The many steps and sloping landscaping mean that it is not an ideal property for the elderly or less mobile. Incredible place, incredible staff, one of the best accommodations my family has ever experienced. 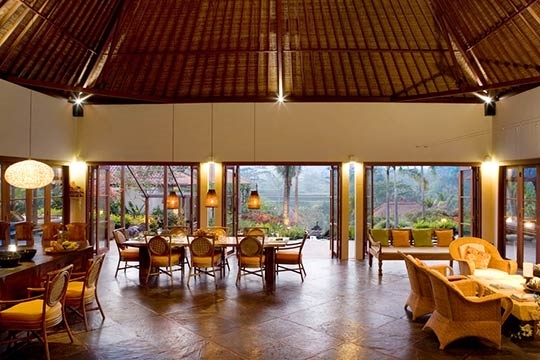 Situated 15 minutes north of central Ubud, Bayad Villa is in a world of its own. 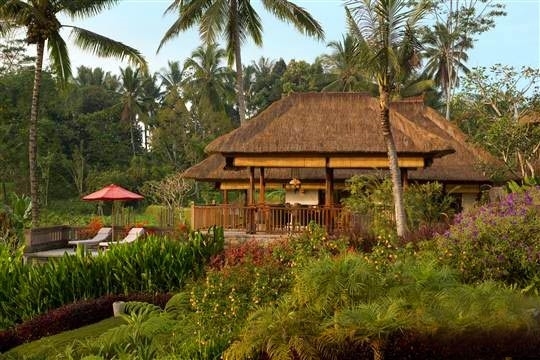 Although it comes with a garden totalling nearly one hectare in extent, the views over terraced paddy and jungle open it up even more. 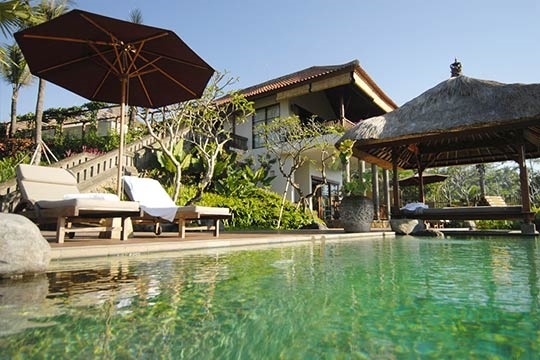 Bayad is neighboured by other private villas though none are in view. 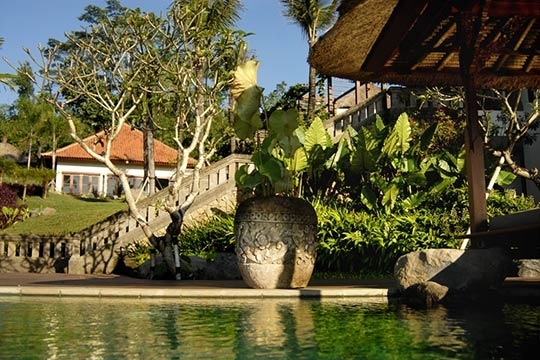 The 100m driveway to the villa is just off the main road where local shops can be found (for simple groceries) but no restaurants, supermarkets or banks: for those amenities, one must travel to Ubud. The entrance to Bayad Villa is via a pergola walkway leading into a main living pavilion that’s situated at the highest part of the property with views over the valley beyond. From the threshold you descend into an open-plan area where to the right is a lounge, to the left is a kitchen whilst straight ahead is a dining table for ten. Leading off from the living room is an air-conditioned study with cable TV, surround-sound, DVD player and stereo wired to play in the living room, whilst opposite the study is a guest bathroom with copper inlaid sink. Beyond the living room a pathway descends via a second floral pergola walkway, to two of the suites, the swimming pool and gym. 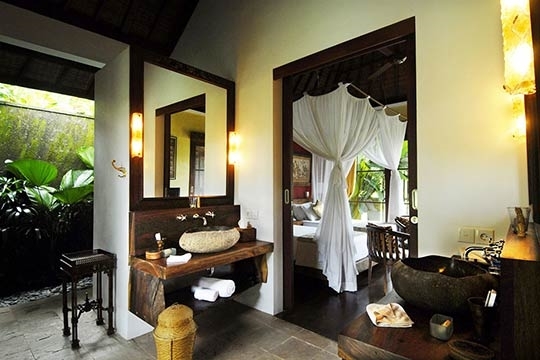 On your left is Klung Kung House, a twin suite bathed in light from sliding doors that open widely on two sides onto a pretty private garden. 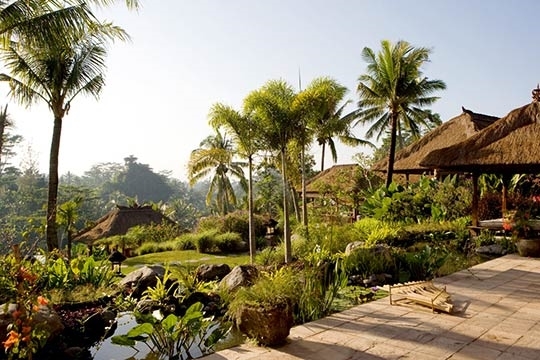 Stepping stones from the terrace lead across a little pond to a raised balé for truly intimate glimpses over the rice fields beyond. 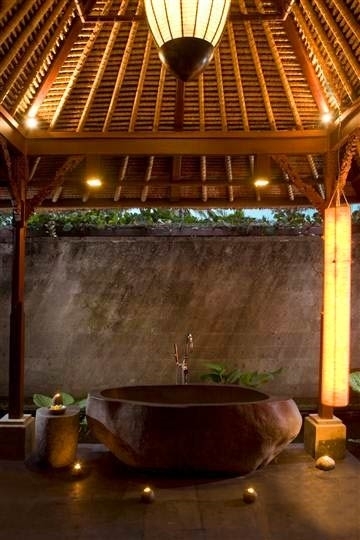 A spa room – featuring a carved rock bathtub and shower – connects the twin with Tenganan, the double master suite that’s spectacularly located to the front of the property with deep furnished balcony overlooking the swimming pool and verdant valley beyond. 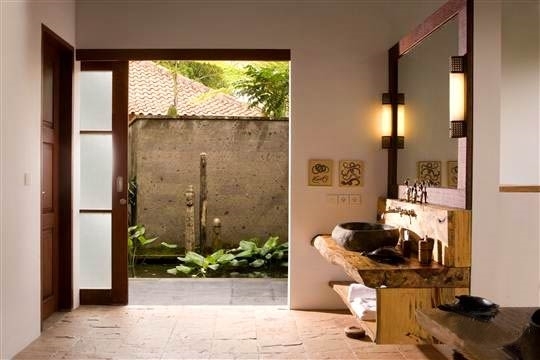 Both Klung Kung and Tenganan’s bathrooms come with carved rock sinks, showers and built-in wardrobes. The main swimming pool is located down a flight of steps from the entrance to the Tenganan suite, and here a balé softly furnished with cushions appears to magically float on top of the water. 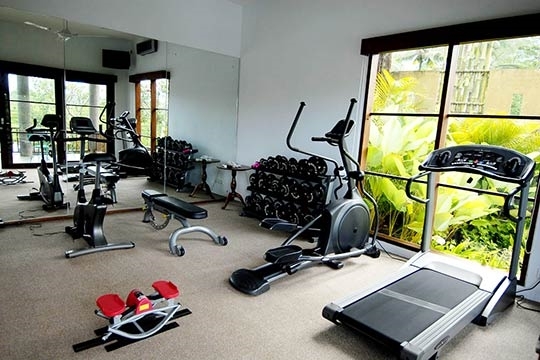 Overlooking the pool and situated directly beneath the Tenganan Suite is a gym fitted with a range of training equipment, a washroom and an informal dining area with kitchenette and built-in BBQ. 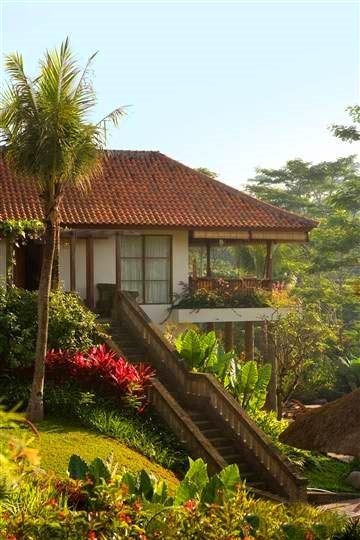 The third and fourth suites, Singaraja and Ubud, are located in a second building, across the sloping front lawn. 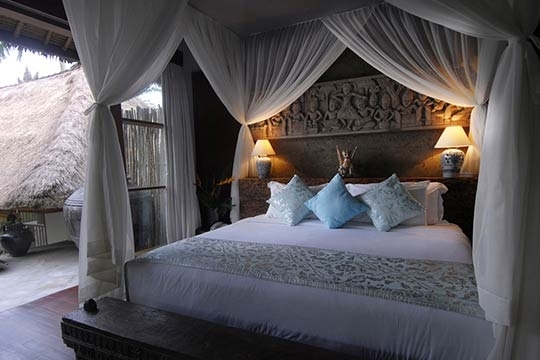 Both suites are of similar size with front terrace, queen-sized bed, private garden and bathroom with both inside and outside shower. 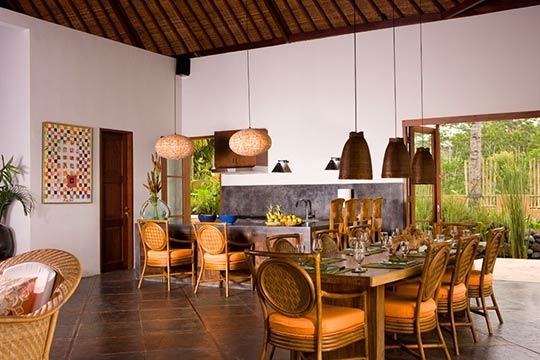 They flank a central open-plan kitchen–dining area that overlooks a terrace with infinity plunge pool. All suites come with fans and air conditioning, cable TV with DVD players, telephones and a selection of antique furnishings and artefacts that characterise each sleeping space. 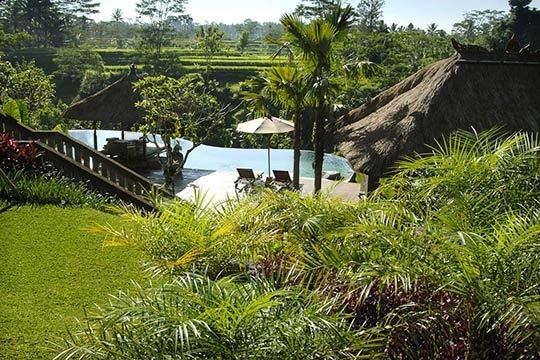 4 bedroom villa located in Ubud, Bali. 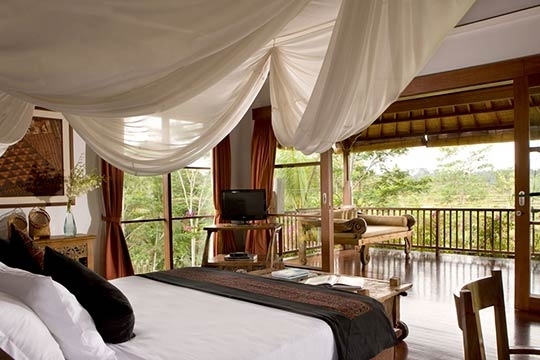 Ideal for Body and soul, Bring the relatives, Kid friendly, Fair share for groups, The great outdoors, Room with a view.